CSR is a business opportunity that allows companies to improve their corporate reputation and to establish, develop and enhance their market share. The concept implies that corporations commit to improve the society and protect the environment, beyond obeying the national and international legal obligations and without detracting from the economic purpose of the enterprise or impairing its competitiveness. The great majority of multinational companies today recognise the public demand for accountability for the social and environmental impact of the company. They can learn to see the economic benefit of extending their scope from short term profit, to long term sustainable growth. CSR training is in high demand. Not least with corporations establishing in countries where the laws of governments do not sufficiently protect nature and people. These courses can enable you to play a part. 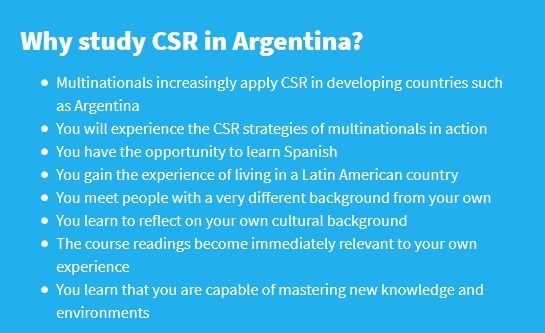 The courses are structured to compare academic theory with the way CSR is implemented across businesses and sectors. As a student you are encouraged to explore and make use of your surrondings, but we also organise fieldtrips to organizations and businesses in Buenos Aires. This brings real life examples and conflicts into the classroom and challenge the more abstract concepts from the literature. The main period: consists of four months of lectures, seminars, field trips and group assignment in Buenos Aires. The self-study assignment and the home exam are handed in electronically, and you may write them wherever you want. 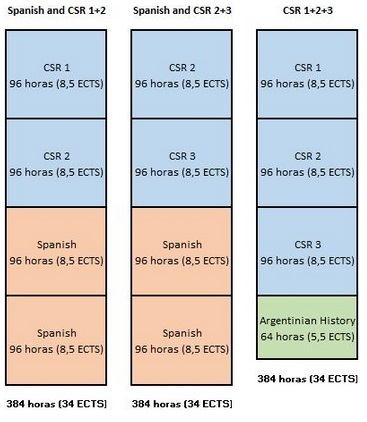 Many students choose to stay in Buenos Aires to finish the home exam before they move on. Students are recruited mainly from Northern Europe. We also have Argentinian students on the programme. The differences in the students´ social, academic and professional backgrounds make for interesting debates and seminar groups. Approximately one third of the students come directly from college, one third has started their bachelor programs and the last third is made up of experienced students. You will study together with students from many different countries, tought by some of the best professors in the world. If English is not your native language, you will soon experience that your language skills improve rapidly. This will be a great benefit both for your future studies and your future career, where you are expected to perform as well in English as in your native language. To apply for the courses you must be eligible for university studies. If you apply for CSR 2, and not 1 and 2, you should already have completed a full year of university studies. Fill in the application form. If there are still places available we will send you an offer with an invoice for the deposit of 250 Euro. By paying the deposit you confirm your place on the programme. Leading up to the start of the programme we will keep you informed about the necessary preparations for travel and studies.